The put the QS world university rankings of Malaysia top local public universities into perspective, we have compiled their rankings in the past five years. Based on this table, we conclude that the best university in Malaysia, University of Malaya (UM), has shown very little progress and is still far from the target of being the top 100. In 2011, former UM vice-chancellor Prof Tan Sri Dr Ghauth Jasmon set the target of UM achieving top 100 by 2015. He has since been fired and replaced by Professor Datuk Dr Mohd Amin Jalaludin in 2013. National University of Malaysia (UKM), which used to be the second best university in Malaysia for many years, has suffered a drastic drop in ranking this year. Feel free to discuss this with other students in our student forum. The world ranking of Malaysia’s top three universities has continued to improve, with Universiti Malaya breaking the top 150, at 146th place, according to the QS World University Rankings 2015/2016 survey and report released today on www.topuniversities.com. The country’s oldest university also received a full five rating under its QS Stars rating system. The star rating system allows students to get a wider picture of an institution’s qualities, looking at everything from the employability of graduates, to sports facilities and community engagement. 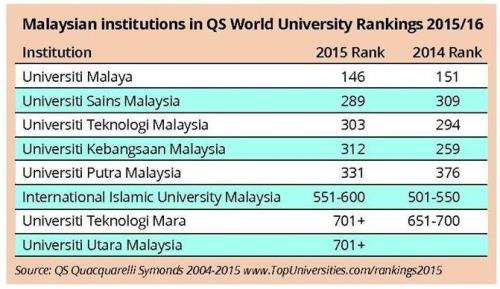 QS Intelligence Unit head of research Ben Sowter said UM, which is ranked 146th, is still Malaysia’s number one. The sharpest rise is seen in USM which is up 20 places to 289 compared to 309 in 2014 and Universiti Putra Malaysia which climbed up 45 places to 331 this year. The global firm also said that the Malaysian universities excelled in two of the five faculty areas, with UM, USM and UTM ranked among the world’s Top 100 for Engineering and Technology while UM and USM sit among the Top 100 for Social Sciences & Management. “The strengths of Malaysian institutions shine in the technical and social sciences while the performance in the world’s ranking has been mixed, with three universities rising mostly as a consequence of the methodological reform applied in this edition, three dropping, one new entry and one unchanged,” said QS head of research Ben Sowter.